Example. Adam has a bunch of features estimated at 1 hour. He takes a three-hour coffee break every day, so he gets 5 of these one hour features done every day. On his time sheet, one of these features actually takes 4 hours even though it was estimated at 1 hour because he took the coffee break in the middle of working on that feature. Eventually, his track record shows that he has an 80% chance of working at velocity 1.0 and a 20% chance of working at velocity 0.25. When EBS runs, 20% of the time that it sees Adam estimating something at 1 hour, EBS will actually use a calculated estimate of 4 hours, which perfectly corrects for Adam’s very predictable coffee breaks. Example. Over the next year, Bonnie proves herself to be a consistent estimator — consistently underestimating each task by half. Even though she seems like a “bad” estimator, her track record fills up with velocities very near 0.5. 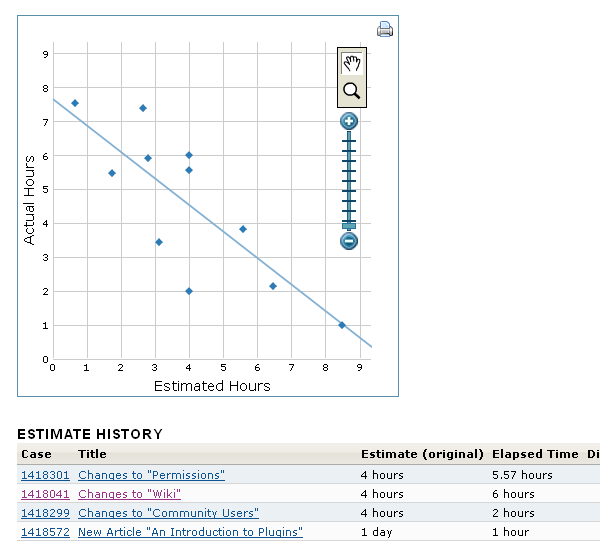 When EBS runs, the calculated estimate is almost always 2 times the entered estimate. EBS actually gets the final date right, and in fact, there is very little variation in this date because Bonnie is a reliable underestimator, so the probability curve is very steep, reflecting the reality that your schedule is quite trustworthy. Example. Chauncey is a member of the company gardening committee. Twice a year, in the spring and fall, he takes off two weeks to plant annuals in the company garden and leaves the clock running on whatever feature he left in progress. There is a certain small probability, reflected in his track record, that a particular short feature will actually take more than two weeks because he’s off gardening. 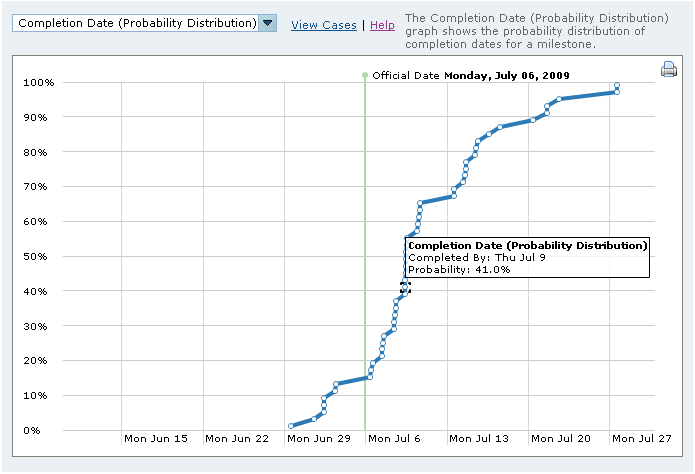 Even though this seems like an unusual outlier and you might be tempted to discard the data point, it actually gives EBS very useful information; with some probability, EBS will generate a schedule in which Chauncey takes a ridiculously long time to do something, and that probability is based on evidence. Over the course of a one year schedule, EBS is very likely to correctly compensate for Chauncey’s gardening excursions. Example. It is far more likely for a feature to go over than to come in early, and when it does go over, it can go over by much more than other features could come in early. It’s easy to imagine an 8-hour feature slipping to 16 hours, 24 hours, or 40 hours as things go wrong and new bugs and new work is discovered, but it’s impossible to imagine an 8-hour feature taking much less than 2 hours. In realistic schedules, this means that features don’t really balance themselves out: early features do not fully compensate for late features, and you can never make up for all that lost time by doing other features more quickly. EBS understands this, measures this, and accounts for this perfectly based on actual historical data.